This is delicious eaten with walnut bread. Wash the beetroot under the cold tap, twist off the leaves and discard and put the beetroot in a pan. Cover with water and bring up to the boil. Boil for 20 minutes or until tender when pierced with a knife. The time will vary depending on the size of beetroot. Drain and, when cool enough to handle, peel off the skin and cut the beetroots into quarters. Meanwhile, separate, wash and dry the lettuce leaves. Put in a large mixing bowl with the chives, mint, walnuts and Feta. Whisk together the honey, lemon juice and walnut oil. Season to taste. Toss the warm beetroot in half the vinaigrette. Add the chopped dill. 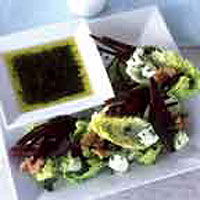 Divide the lettuce mixture between 4 plates, add the dressed beetroot and serve immediately with the remaining vinaigrette.